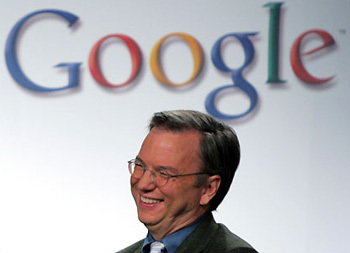 Google Executive Chairman Eric Schmidt has suggested that it would be a mistake for Congress to approve Hollywood-backed legislation aimed at combating online piracy because it would be ineffective and could fundamentally alter the way the Internet works. Companion bills before the House and Senate would allow copyright holders to go to court to compel credit card companies and online advertising companies, including Google, to cut off websites dedicated to distributing pirated material. Prosecutors would be able to obtain court orders forcing search engines to drop the sites. The House’s Stop Online Piracy Act and the Senate’s Protect IP Act are backed by the Motion Picture Association of America, the Recording Industry Association of America and the US Chamber of Commerce, which estimates the cost of online piracy at $135 million a year. Internet giants Google, Yahoo! and Facebook strongly oppose the legislation. Responding to a question following an address at the University of Minnesota about how technology is changing business, technology and government, Schmidt said it would be a mistake to adopt the bills’ approach to fighting piracy. “The problem with the two bills is that they go after all the wrong problems,” he said. “They are essentially censorship bills. They violate all sorts of free speech issues. They give people who are complainants the right to delete links from the Internet. And in one version, they actually criminalise the indexing of that content through the search engine. That’s a very, very slippery slope,” he warned. Senator Amy Klobuchar has introduced a separate bill that would update current federal copyright law to make clear that streaming copyrighted material for commercial purposes can be prosecuted as a felony.